The 100,000 Genomes Project is cementing the NHS’s position as one of the most advanced healthcare systems in the world, and is providing the foundation for a new era of personalised medicine, and this in turn will contribute towards delivering high quality care for all, now and for future generations. The 100,000 Genomes Project aims to bring the benefits of personalised medicine to the NHS. To make sure patients benefit from innovations in genomics, the Government has committed to sequencing 100,000 whole human genomes, from 70,000 patients, by the end of 2018. NHS England has established 13 NHS Genomics Medicine Centres (GMC) to cover the country delivering an end-to-end genomic medicine pathway. They are enabling the participation of patients and family members with their informed consent; collecting samples to extract DNA; capturing clinical information to inform the interpretation of the genome sequence; and establishing the infrastructure to make genomic medicine a routine part of NHS care. All NHS GMCs work to a highly detailed, and constantly updated, service specification set by NHS England, which at its core is about delivering to high quality standards and establishing an infrastructure to support personalised medicine. This common approach ensures consistency and coherence across the NHS to gain maximum benefits from this application of genomic technologies and curation of knowledge, and is laying the foundations for the future. 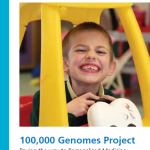 For further information about the 100,000 Genomes Project, please see the Genomics England website. To find out details on genomics education and training for NHS staff, please see the relevant section of the Heath Education England website. If you have any queries regarding any aspect of the 100,000 Genome Project please contact the Genomics Central Coordinating Team Genomics Implementation Unit at NHS England by email: england.genomics@nhs.net.